We have great news! 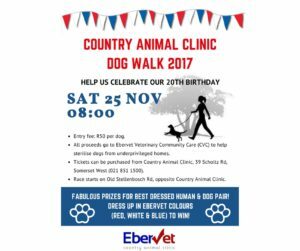 The Country Animal Clinic Dog Walk is being hosted by celebrity TV presenter, Lizma van Zyl. Lizma will join us on 25 November and will be handing out prizes. Country Animal Clinic’s first Dog Walk is in celebration of our 20th anniversary. The clinic in Somerset West was the first veterinary clinic owned by veterinarian Dr Hilldidge Beer. Today it is run by veterinarian Dr Ingrid de Wet, ably assisted by her veterinary colleagues and assistants. Over the years, hundreds of clients and their pets – dogs, cats, hamsters, rabbits, birds and even the odd squirrel or two – have visited us and come to be part of the Country family. In celebration of two decades of veterinary service, and the fantastic relationship we have with you and your pets, we’re inviting you to join us on our first ever Country Animal Clinic Dog Walk. It’ll be loads of fun, with lots of prizes to be won, but best of all it’s just the kind of exercise a healthy dog needs! Distance: 3km. Water will be provided for every human walker courtesy of Spar. There will be marshalls on route. Entry fee: R50. All proceeds to EberVet Community Veterinary Care (CVC) which sterilises welfare pets at no cost to their impoverished owners. 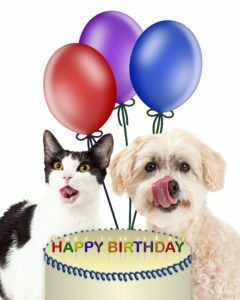 Prizes: Vouchers worth thousands of Rands; hampers; spot prizes including dog bowls, toys, treats and more. What to wear: pets and owners dressed in the EberVet colours of red, white and blue are automatically entered into our prize draw! Please keep dogs on leads at all times. Obesity is rarely recognised by pet owners. We see our pets as cuddly rather than fat but obesity can be a killer. Many ailments are exacerbated by being overweight. Walking your dog regularly (preferably every day) is one of the easiest ways to keep your dog’s weight in check, or to help him or her lose weight. It is also a weight bearing exercise so your dog’s bones are strengthened, and assists with circulation so his/her heart is kept healthy. What is EberVet Community Veterinary Care? EberVet CVC sterilises pets in impoverished areas at no cost to their owners. Our CVC team travels hundreds of kilometres each year to small towns and villages where there is often no resident vet. With the help of local animal welfare organisations, we sterilise up to 25 pets per day. It costs their impoverished owners, many of whom are unemployed and living on welfare, nothing. We also treat wounds and illnesses such as biliary and will vaccinate against common diseases and rabies. Proceeds from the Country Animal Clinic Dog Walk will go to EberVet CVC.